Your home is the place in this world where you should feel safer than ever. It’s where you sleep at night and where you raise your children. Did you know that just having four walls and a roof is not enough protection against certain weather effects. Learn what you can do to protect your house from the weather so you can enjoy greater peace of mind. Without taking proper precautions, your home can have dozens or possibly even hundreds of points of entry for the wind and rain. Cold air drafts cause your home to be very chilly and drive up your heating bill. Water gets in through cracks and then spreads to your frame and the drywall. At best it can warp the wood, and as at worst it nourishes mold, which is a major health hazard that can end up being so bad that you have to evacuate your home without taking any of your possessions. After this your house and everything inside gets torn down. With the proper vapor barrier you an also prevent radon from rising up into your home. If you’re like many homeowners, you’re probably happy with just caulking any open seams that you see on the outside of your home. If so, you’re forgetting one very important spot for weather protection. The crawl space underneath your house is useful for allowing you to run lines for utilities and to make repairs. It also keeps the building from being in contact with the cold ground. When you’re installing a moisture barrier below your home, you have multiple options as far as materials go. Elastomeric coatings and paint An elastomeric coating is similar to a very thick paint. It’s formulated with additives that make the final coating very flexible, as well as mostly impermeable. Elastomeric coatings should go up only over finished surfaces, not on bare dirt. Asphalt paper: This product is similar to roofing paper. In fact, some folks use roofing paper as a makeshift moisture barrier. 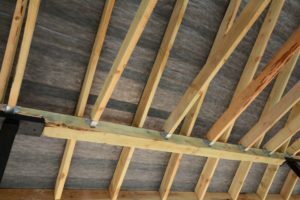 This makes sense, as roofing paper is designed for use as a moisture barrier for your roof. Polyethylene: This is a thin layer of of plastic film that you lay down over the ground below your house., It’s fast and easy to put in, and comes in different thicknesses. The thicker the film the more durable it is, which is especially important if you deal with mice and other creatures that might try to claw through. Once you have a vapor barrier in place, your home enjoys an added layer of protection. But like all components of a house, you need to provide periodic maintenance. This includes making regular trips down below your home and using a flashlight to make sure that there are no major holes in your protective layer, and that it isn’t coming up in some areas. Here in the Northwest, it’s critical to do this sort of inspection before the rainy season comes. Once the water gets in through the barriers, damage can start after a single rainstorm. There is more to weatherproofing than simply putting down a layer of impermeable material. There are many other routes for water to come in under your house than simply the ground. Make sure to caulk any seams in the siding. You also want to seal around any vent covers or other holes in the exterior. Make sure that the siding is flush against the wall and that there are no warped areas where water could enter. You also want to make sure to weatherize the rest of your home. Proper weather protection for your home really is an all or nothing proposition. Focusing only on a moisture barrier underneath while not properly insulating the walls and attic is like going out in the rain with pants on but now shirt. Sealing up your home for heat and moisture protection entails caulking all cracks, sealing up the windows, and possibly getting more energy-efficient windows. 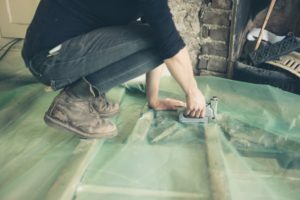 If you don’t have a lot of expertise in home repair or other projects, it’s a good idea to turn to a professional for creating a moisture barrier. 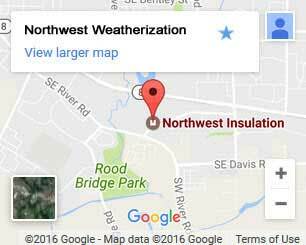 Northwest Portland is your top shop for weatherization in Portland, OR and all of the surrounding areas. We’ve been in business for years and employ a team of highly experienced technicians. They’re certified in PTCS and LEAD, and know just how to accomplish every task, regardless of your special circumstances. Set up a free consultation by giving us a call or using the contact form on this website. WE get back to you right away and get together at a time that works for you. Our team works at virtually any scale and within a wide range of different budgets.Starting with your moisture barrier we can work our way up, ensuring that your home is warm and comfortable, as well as protected from the elements. We’re a family shop from Hillsboro and we understand the local climate and how it relates to your needs. The only thing more important than your need for shelter is the safety of your family. With proper preparation, you an take care of both. Here at Northwest Weatherization we can not only install the necessary material but you can also schedule us for regular maintenance checks to ensure that your protection level remains high. You don’t have to leave your family’s comfort and well-being to chance. Call Northwest Weatherization today.